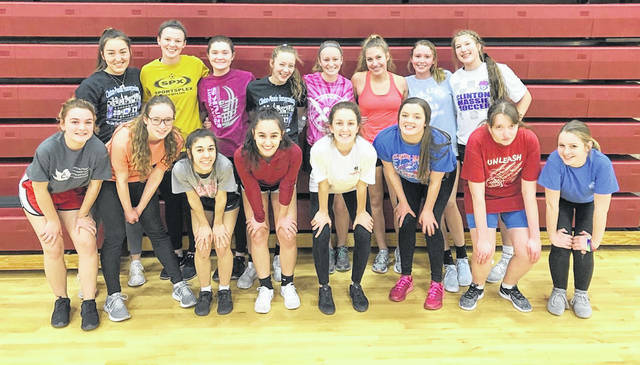 The Clinton-Massie girls track and field team, from left to right, front row, Holly Wilson, Elisa Mueller, Ally Wellman, Mileigh Marshall, Molly Lynch, Holly Young, Olivia Thesken, Lakota Hart; back row, Carly Moritz, Kaylynn Woolverton, Courtney Fisher, Nora Voisey, AJ Houseman, Emma Muterspaw, Kenley Robinson, Ashley Doyle. ADAMS TOWNSHIP – A.J. Houseman is the lone senior on the Clinton-Massie girls track and field team. Coach Dean Richardson, in his fourth year as head coach at the varsity level, says his Lady Falcons are working hard. Houseman, Emma Muterspaw and Nora Voisey are first-team All-SBAAC all-stars returning this season. All three were members of the 4×800-meter relay. Muterspaw was a regional qualifier in cross country this fall. Molly Lynch, Rylee Richardson and Ally Wellman are members of last year’s regional qualifying 4×200-meter relay team that returns. Patience Chowning, who did not run track last season, returns to the program this season. Kenley Robinson and Ashley Doyle also are key newcomers for the Lady Falcons. Massie was fifth last season in the SBAAC American Division. Richardson is assisted by Brian Mudd, Scott Rolf, Jordan Phipps, Jim Wagner, Jimmy Brady and Ken Holter. The key loss from last year’s team is Katie Hughes, a multi-sport All-SBAAC all-star who is now a standout runner at Wilmington College. Richardson said Western Brown and New Richmond are the team’s to be in the league this season.